Please join us as we welcome Maggie Costello to teach with us at Folly Beach Island Yoga! Maggie is a native of St. Louis, Missouri. She has lived in Charleston, South Carolina since 2005. 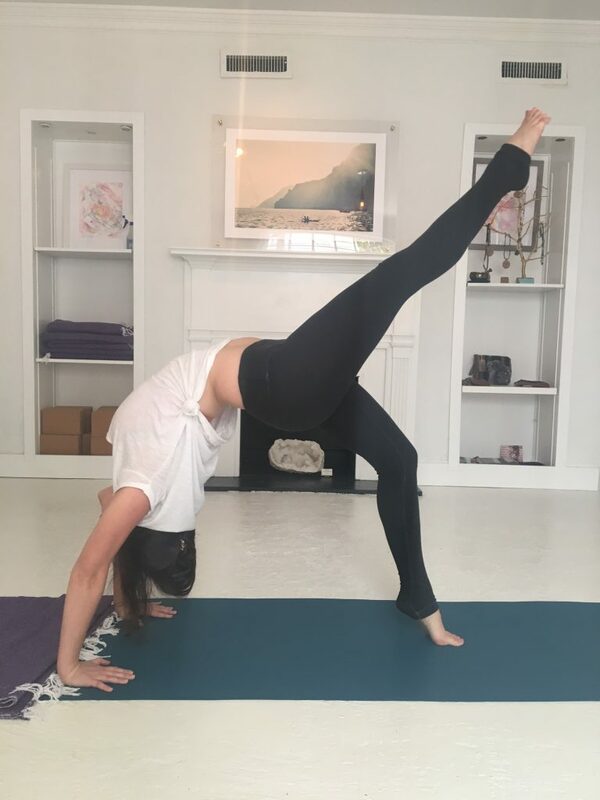 Maggie has been practicing yoga since the age of 17 & is eager to spread her knowledge of yoga & how to incorporate it in everyday life, on and off of the mat. Join Maggie next Wednesday, October 25, at 10 a.m. for her first beach yoga class on the 5th Street East beach, and read more about her here. Wow. I think I just got all gushy about my own job! Ha! It really is such an amazing treat to be able to teach on the sand on Folly Beach. Every time I walk toward the beach I get that some giddiness I did when I was a kid. Please use the restroom before you get to the beach! The 5th Street East beach access does not have a public restroom. We recommend bringing a towel or two for the beach. Though you may enjoy layering and putting the yoga mat on top, the towel’s texture really works better on the sand. Please bring plenty of water and arrive fully hydrated. Apply sunscreen before the class.–and if you forget to apply it don’t be shy about asking others to borrow some. If at any time you feel lightheaded or unwell, take a rest. The sun’s rays are much more intense with the reflection from the ocean and sand. Updates for weather on all of our outdoor yoga classes will be posted on our Facebook page. This is the quickest way for us to get information out as the weather does sometimes rapidly change on the island. We offer some limited private online yoga training. Ideal for those who travel frequently or who simply want a more personalized yoga experience. Offered as both a stand-alone online training arrangement as well as a hybrid option. 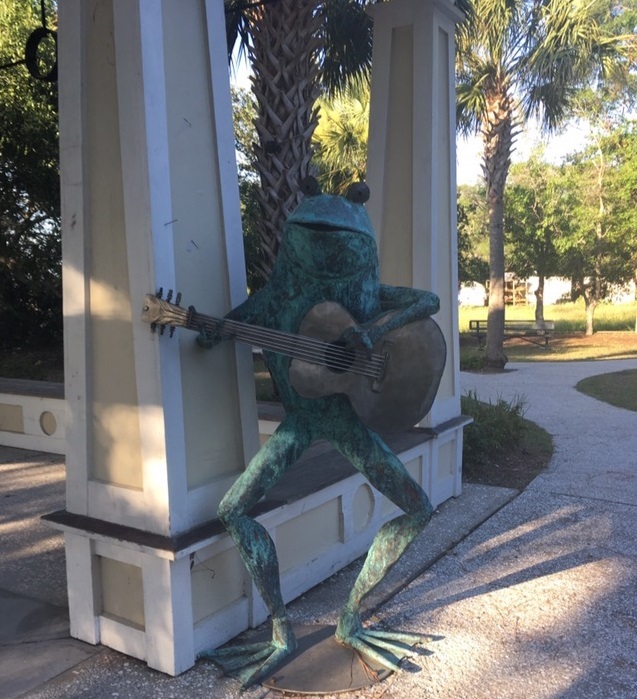 For those who travel in and around the Charleston, SC area for business or vacation we can offer in-person training as well as private seaside yoga lessons on both Folly Beach and Kiawah Island. Please contact us to discuss your goals. 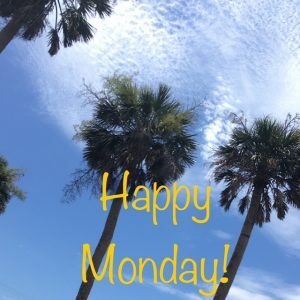 Reminder that we have several chances for beach yoga this week! 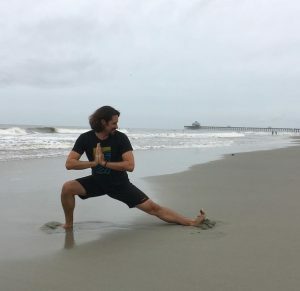 Catch Matt Foley today (Tuesday, July 25) at 7 p.m. and again on Saturday, July 29 at 9:00 a.m.
Matt Stevens will be teaching his beach yoga class on Wednesday, July 26 at 7 p.m.
All of our beach classes meet at the 5th Street East beach (left of the pier) and are $12 – reserve your spot online or pay at the class. Cash and all major credit cards are accepted on the beach. We’re happy to arrange a small group class or private session for you if you’d prefer. Please contact us to schedule private lessons or small groups. Also on Friday night we will be offering a free beach yoga class for autism parents and caregivers at 7 p.m.
For indoor yoga this week join us upstairs at St. James Gate Irish Pub (11 Center Street, Folly Beach) on both Saturday (at 11 a.m.) and Sunday (at 10 a.m.) for an indoor yoga class just a short walk from the beach. Working on the weekend isn’t so bad when this is your walkway in to work! Entrance to the beach at 5th Street East (left of pier) Folly Beach, SC where we teach beach yoga! 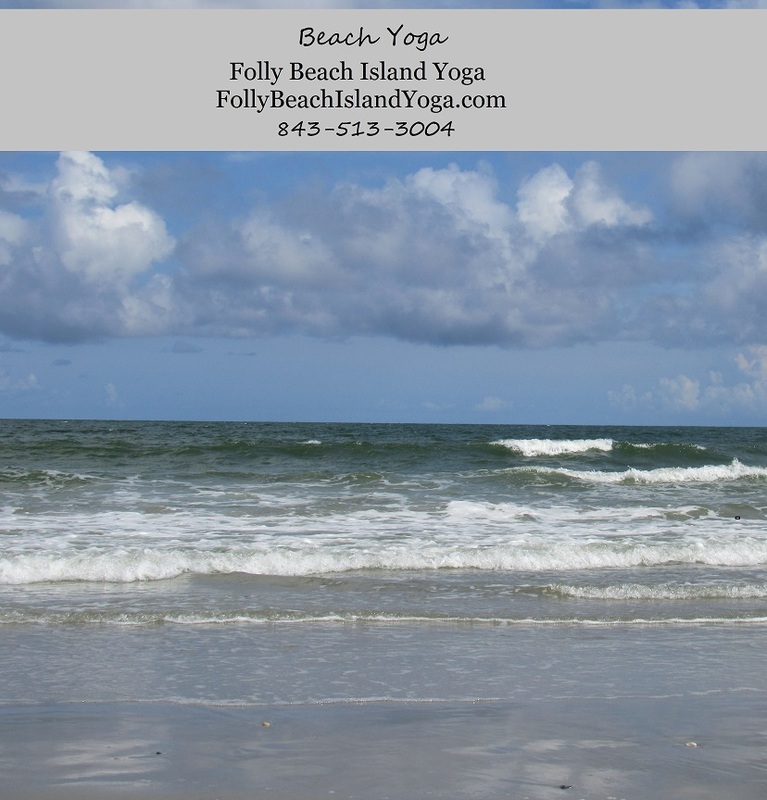 Beach Yoga on Folly with Matt Tomorrow! It’s back in the swing of things this week with a Tuesday evening sunset beach yoga class by Matt Foley at 7 p.m. on this very spot on the beach at 5th Street East, Folly Beach, SC. 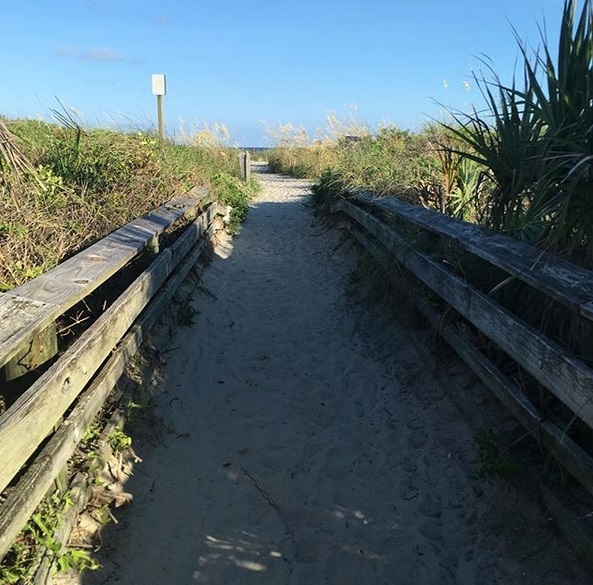 Come practice in the sand and enjoy the pier view on this stunning barrier island near Charleston, SC. Hang out just a little longer and you’ll be just in time to catch the sunset! Remember to bring plenty of water and a large towel, or mat if you prefer. Classes are only $12 and you can even save up to 10% with 3, 5, or 10 pack class passes online. Whether you’re on vacation and looking for things to do on the island, or you’re a local unwinding after a long work day sunset yoga is an experience that you must try. A paid parking lot is available at the beach entrance as are a limited number of free street side parking spots. Please remember to park your car facing the same direction as the flow of traffic and to pull your tires fully off the road if you choose street side parking. Hope you’re having an amazing day. Make the most of it. 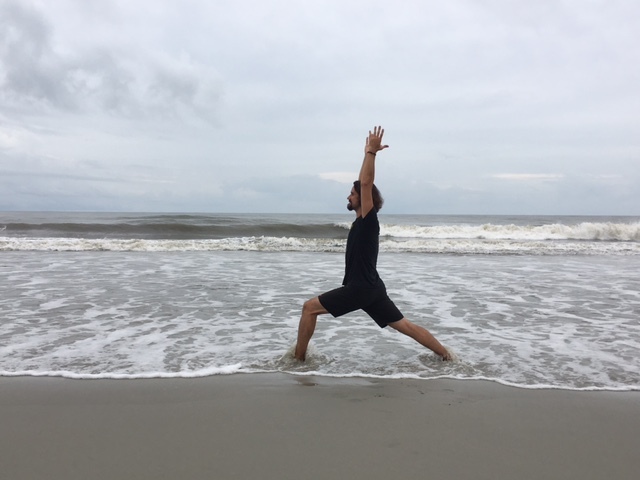 Wednesday, 6/28 – Sunset beach yoga with Matt Foley at 5th Street East, Folly Beach – 7 p.m.
Thursday, 6/29 – Free beach yoga class for autism parents & caregivers – 6 p.m.
Friday, 6/30 – Sunset beach yoga with Matt Stevens at 5th Street East, Folly Beach – 7 p.m.
Saturday, 7/1 – Beach yoga with Matt Foley at 5th Street East, Folly Beach – 9 a.m.
Saturday, 7/1 – Yoga upstairs at St. James Gate Irish Pub, 11 Center Street, Folly Beach, 11 a.m.
Sunday, 7/2 – Yoga upstairs at St. James Gate Irish Pub, 11 Center Street, Folly Beach, 10 a.m.
Purchase passes for our classes here or just pay at the class. Cash & all major credit cards accepted.